What did you expect though? I didn't watch the game, but just saw the result. Leipzig is a much superior team. Well, i watched the match, we basically got totally outplayed for 80 minutes and got a consolation goal when they stopped playing at the end. Meanwhile, Sarpsborg is fighting all over the pitch and leading deserved vs Genk. How we are leading the domestic table and could get to the cup final this season is beyond me. Another EL game, another joke performance, but i have gotten used to it by now, its like months since we actually played a decent game, home or abroad. Watched that game, Rosenborg is really an abysmal team. French teams dominating in the EL. Molde and Brann should be ashamed of themselves for letting us win the league this season. Its not in our DNA to play football, we are born for skiing and thats pretty much it. 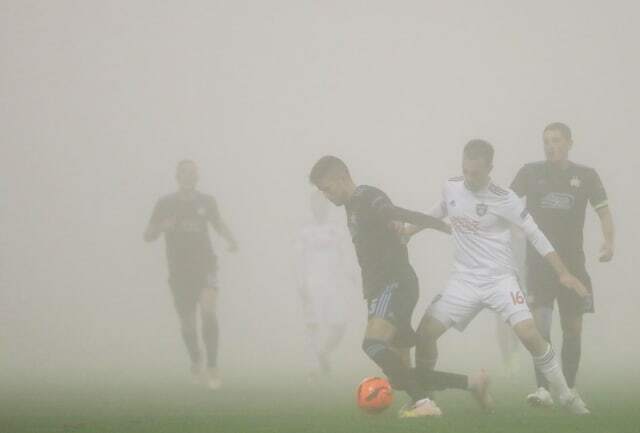 this is how the game looked like... there was a heavy fog an entire match. Andres DON Iniesta is the only player in football's history to be Man of the Match in a Champions League final, EURO final and World Cup final. Were you there? Stadium was full, I hear? Don't know if people could see anything in that fog. This is worst week in entire year at my work. UEFA just confirmed that 3rd tier European club competition will be played from next season on. I like that they added a competition, but for fucks sake, you could've been a bit more imaginative with the name. Isn't it only a working title? Good to see Sevilla and Villarreal winning their respective groups. Betis to follow suit later tonight. A shame that Valencia failed to qualify for the round of 16. They were better than Man Utd in their two direct meetings but messed up against Young Boys away from home and they were not as lucky against Juve as Man Utd was. At least they got the third spot. Despite much talk about Spanish football being on a downward spiral, the UEFA coefficient list so far this season shows something else. Still at the top. Good to see Italian teams doing rather well as well. Inter being Inter did not help and Napoli were simply very unlucky in that group. They should frankly have topped that group in fact. The Germans seem to be bouncing back while the French teams have been pathetic so far this season with only 3 remaining representatives in QSG, Lyon and Rennes that barely just qualified against Astana. The PL doing rather well as well. All that money and those managers were bound to make a difference eventually. Not sure if an English team will win a single European trophy this season though. Hopefully not. Last edited by Leo_Messi; 13th December 2018 at 07:24 PM. Very successful group phase for the Austrian teams. Rapid, though generally weak, qualified for KO stage and Salzburg very confident with zero dropped points. All times are GMT +1. The time now is 04:22 PM.